Usually when Riot tweaks stuff in League of Legends, they do so strictly because of balance considerations. Maybe a character is too weak in one area, or too strong in another. Today the developer took a surprising approach, saying that it’s reworking four middling champs because they aren’t interesting. What’s neat about the changes made to all these champions is that Riot isn’t addressing them because they’re hopelessly weak in the current meta. Well, except for maybe Mordekaiser. But the other three can still be solid picks. Rather, what Riot said it’s trying to do with all of them is make these characters feel more distinctive when you’re playing as them or against them. Like fully fledged, unique characters that you have to contend with in their own special way. Now, some champs already bring their unique brand of play to League. Take Blitzcrank into a game and you’ll heavily affect the way both teams play. Instead of looking for solid initiation, your team will more likely wait for you to pull off a successful pick, while the enemy team will position their frontline in the hope of getting grabbed. And Rocket Grab is just one ability on one champion! Plenty of other champs have similar impact, from Gnar with his rage meter, to Yasuo with his Wind Wall. But while we succeeded with some, we frankly didn’t with others (such as Darius and Garen) and, when two champs play the same way, you just end up picking the one that does the same things better. The result is the same folks played in every game (unless that power balance shifts), and each game of League feeling similar. That’s one of the main things we wanted to begin solving with this update. The Blitzcrank “Rocket Grab” they’re referring to here is a ranged attack move that the mech champion is well-known for. It lets him yank a target towards him, making it a devastating maneuver whenever he successfully plucks a single enemy from a group to deposit them straight into the claws of his teammates. Riot has a point here. For better or worse, a Blitzcrank player who can nail his grabs shapes the entire course of a match. You feel his presence in the game, often literally. You can say the same thing about many of League’s most memorable champs: Morgana with her ranged snare attack, Sion with his wonderfully scary charge move, Teemo with those insufferable poison traps. Garen, on the other hand? He’s ok, gameplay wise, I guess. But much like his knight-in-shining-armor veneer, the guy’s sort of...white bread at this point. He looks like an archetype, and feels like one too. [NEW] Passive: Garen identifies the enemy champion with the most recent kills as the enemy team’s Villain. Judgment ticks and basic attacks on the Villain deal an additional 1% of their max Health as true damage. Active: Garen calls upon the might of Demacia to deal a finishing blow to a targeted enemy. The more health they’re missing, the more damage Demacian Justice will deal. [NEW] Demacian Justice deals true damage to the enemy team’s Villain. Now Garen has an active and unique role in every game: to destroy any foe, regardless of how tanky they are, so long as they’ve recently killed one of his friends (champions on his team). This isn’t just cool in design terms, it’s also super fitting to his character’s fantasy: now Garen’s a protector of the weak both in and out of game, and has a kit that directly opposes Darius’. This isn’t a static rivalry either - Villainy will adapt as the game progresses, changing Garen’s target as his enemies rise to - and fall from - power. So Garen’s kit not motivates the people playing as him to pursue specific enemies—targets that could change on the fly, depending on how well the enemy team is doing in a match. Hemorrhage: Darius cuts enemies he attacks, causing them to bleed. Hemorrhage can stack up to five times. [New] Bloodrage: Whenever Darius executes an enemy with Noxian Guillotine or fully stacks Hemorrhage on a target, he gains Bloodrage for a few seconds. While under the effects of Bloodrage, Darius deals greatly increased physical damage and applies max Hemorrhage stacks to all enemies he hits. The idea here is to give Darius the means to be Darius. The damage amp upon fully stacking Bloodrage is huge, but he still has to work to get it. Opponents will have to be much more cautious about letting the Hand of Noxus get his passive stacks going - preventing him from gaining stacks means he won’t go into Bloodrage which, in turn, means he’ll have a much harder time chaining his executions together. But when he does… well… there will be pentakills. Stacking passives are something League’s been using more and more of lately with new character addition and updates for old ones. Players can argue about whether or not that’s a good thing in the long run. But at least in this case, it sounds like the passive will motivate those playing against Darius to zone the guy away from attack one target too many times. Whenever Skarner is in a game, six crystal spires appear on the Rift. They’re located by red buff, blue buff, Baron, and Dragon.These crystal spires are capturable, just like the altars on Twisted Treeline. When someone on the lonely scorpion’s team captures a spire, it creates a zone that gives Skarner (only Skarner!) pretty significant boosts to his movement and attack speed. The enemy team can capture them too and, when they do, they gain gold, a short burst of vision, and temporarily lock Skarner out from his super meaningful buffs. 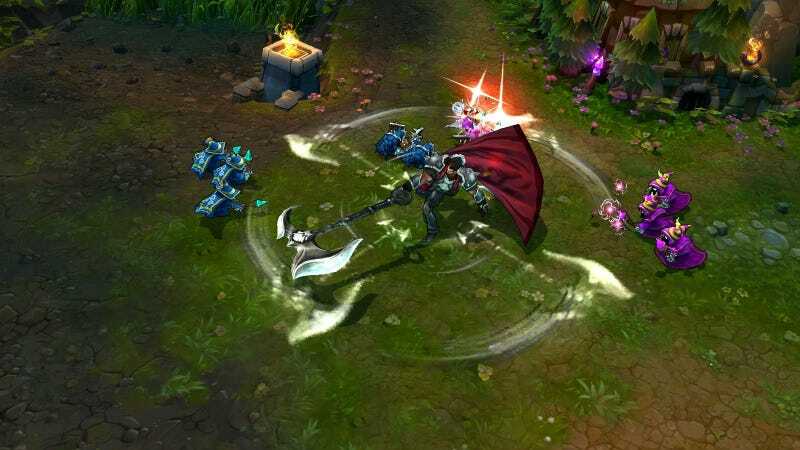 That’s the key - with these changes, Skarner becomes a neutral objective control king, and super useful for teams looking to overcome their enemies with buff and map control. I suppose these changes are fine, since Skarner is technically a jungler. But they sound oddly over-designed. They don’t address anything about his actual ability kit, just the extrinsic factors around him. Given how much the jungle’s been changing in League of Legends in recent months, I’m not sure how tackling the champion this way will play out. Last but certainly not least, he’ll summon a ghost version of the Summoner’s Rift dragon if his team kills it while he’s attacking it. Ghost dragons?!?! The craziest part is that they’re announcing all these changes barely two months before the League of Legends World Championships, which could mean all the pro teams that are still in the running are going to have to adapt to some serious reworks on the fly. They didn’t say anything about the timing of the updates, though, other than a brief line about how “there’ll be more info in upcoming patch notes,” which usually roll out every two weeks or so. Mordekaiser has been a very weak pick in League for a while now, though, so I guess it’s good to see that Riot is trying to find a place for him again...even if it needs to shove him into that place with ghost dragons and the like.